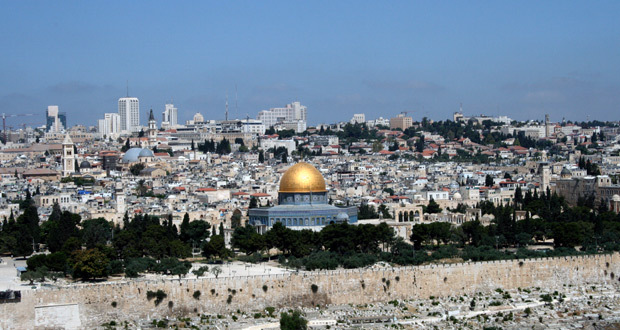 A view of the city of Jerusalem from the Mount of Olives. Photo by T. Keener. Jesus was betrayed by Judas and arrested by the authorities sometime after Thursday midnight, so on in the early hours of Friday morning the first trial of Jesus is set in motion. Jesus is before the former high priest Annas, the father-in-law of Caiaphas. Caiaphas was the one who had told the Jewish leaders that it would be good if one man died for the people. Annas had Jesus bound and sent Him to Caiaphas. The religious leaders then lead Jesus into the courtyard asking others to testify against Jesus, for they were seeking to put Him to death. Just as the sun was about to rise Peter is confronted as being seen with Jesus. He denies his relationship with Jesus three times. Immediately the rooster crows and Peter breaks down and weeps bitterly. The chief priest and elders had heard enough and decided to condemn Jesus. They bind Him and deliver Him to Pilate. When Judas learned that they had condemned Jesus, he brought back the silver they had given him. Judas told them that Jesus was innocent. After throwing down the money, he ran out and hung himself. Pilate listens to the complaints about Jesus and questions Him. He asks Jesus if He is the King of the Jews. Jesus replies, “You have said so.” Pilate is amazed that Jesus makes no other responses to the questions and charges. Finally Pilate tells the religious leaders that he finds no grounds for the charges against Jesus. The religious leaders are relentless and continue to make their case against Jesus, but in their arguments they reveal that Jesus is from Galilee. Pilate, discovering that Jesus is a Galilean, sends Him to King Herod. 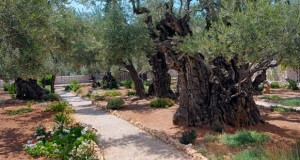 Herod was in Jerusalem at this time and was anxious to see Jesus. He was hoping to see some kind of miracle but Jesus remained quiet. Herod also finds Jesus innocent. The soldiers and Herod mock Jesus, dress Him in a robe and send Him back to Pilate. The scripture tells us that Jesus, carrying his own cross, went out to Golgotha (which means Place of a Skull). Here they crucified Him. 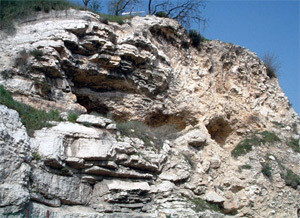 There are no details as to the exact location of Golgotha but some believe it was possibly at the location pictured above. You can see the image of a skull on the mountain. Outside the city of Jerusalem on a hill. Photo by T. Keener. Pilate again sees no basis for the charges against Jesus and believes He should be released. The pressure from the religious leaders and the crowd overwhelms Pilate. In an effort to appease the crowd, and perhaps to suppress an upraising, Pilate releases the prisoner Barabbas and sends Jesus to be beaten and crucified. The soldiers take Jesus to the place called Golgotha (which means Place of a Skull). Sometime around noon the sky becomes dark, which is symbolic of the Father turning His back on Jesus as He carries the weight of our sins on the cross. Jesus cries out with a loud voice and suddenly the curtain of the Temple was torn in two. 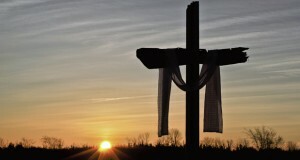 In this selfless act He, the spotless Son of God became sin for us, as He died on the cross. Jesus was on the cross for approximately six hours. Joseph of Arimathea went to Pilate and asked for the body of Jesus. 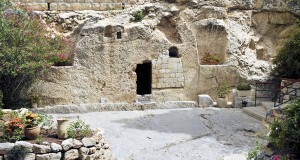 Jesus’ body was taken down, wrapped in linen and they laid Him in Joseph’s tomb, which was cut out of rock, before the Sabbath began at sunset.